The Ton is celebrating 4 years this month and Effie has introduced 9 new designs for this release. There are some free gifts with purchase promotions ongoing. Head over to The Ton's blog for more details. You should have arrived from the blog of my friend Vera Yates. With so many pretty products in this release it was hard to decide what to play with. I chose the Smiling Cosmos stamp set. I love to color and do beautiful shading with Copic markers with this type of image but sometimes that can be intimidating or time consuming. So I decided to show three ways to create with this image that does not take a lot of time and coloring. My first card heat embosses the image in white on kraft cardstock for a striking image with very little effort. I stamped the floral image on Neenah Desert Storm cardstock using Versamark and heat embossed it with Hero Arts white embossing powder. A stitched rectangle die was used to it the piece down and it was matted with a very thin margin of black cardstock. The rest of the card used white cardstock that was crimped with a Fiskars paper crimper, My Favorite Things patterned paper and more black cardstock. Heating embossing was used for the greeting and I added a May Arts twine bow. My second card used a "new to me" product -- Tonic Shimmer Powders. Oh my goodness these are fun to use and allow you to create a stunning background really quickly and easily. To create this card I stamped the image using Versamark ink on Canson Watercolor paper and heat embossed with Hero Arts white embossing powder. I sprayed some water on the surface and then lightly tapped on the bottom of the bottle of Nuvo Shimmer Powder. (I used blue, green and yellow). Then I sprayed more water to get the colors to bloom. If they pooled too much then I used a paper towel to dab some off. Then I let it dry. This stuff if so fun and I can't wait to play with them again. The rest of the card was pretty self-explanatory to make -- I added some embellishments at the end to finish the card. For my last card I did what I call partial Copic coloring. I stamped the image in black on Neenah Solar White cardstock. Instead coloring the whole image and shading I chose a light color and colored just part of the image, leaving some white showing. This adds a hint of color but goes very quickly. I covered the flower centers with Nuvo clear drops and outlined all of the image with grey Copic to create a shadow and a bit of dimension. The striped paper strip is from My Favorite Things and I stamped the Hello in black in on a little banner I cut out. Jana Millen - You are here! GIVEAWAYS: There are also giveaways everyday on these mini hops! 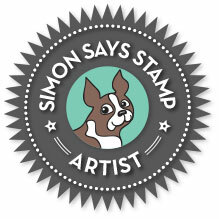 Win a stamp of choice from The Ton's new release. To enter, leave a comment on each blog each day. Effie will choose one winner per day (4 winners total) and announce the winners on The Ton's blog by January 12. The comment period for these giveaways will close on January 11 at 7pm EST. Now head on over to Laurel Beard's blog and see what inspiration she has for us today. Wonderful set of cards!! Each one is beautiful! All of your cards are beautiful and would be so easy to recreate. I don't have a favorite because I love each one for different reasons. Thanks for sharing your talent! Your coloring is beautiful but I have to say that I love the white on kraft....very elegant. TFS! I love all the techniques! These flowers are so beautiful embossed! Thanks for sharing your pretty cards. Love all of your cards but I will admit that second one is a favorite. The color combination is just so pretty! Beautiful cards! Love the blues in the second card. Your artwork is amazing.